Arugula is one of my all-time favorite greens. There is something so magical about each spicy and peppery bite that you just can’t replicate with the boring romaine or iceberg varieties that dominate the shelves at the store. Don’t get me wrong, there is a time and place for all types of greens – I do like romaine lettuce for the killer caesar salad we do (I promise to do a post on this soon)…but years of salads heavy on the iceberg has turned me off it for a while. 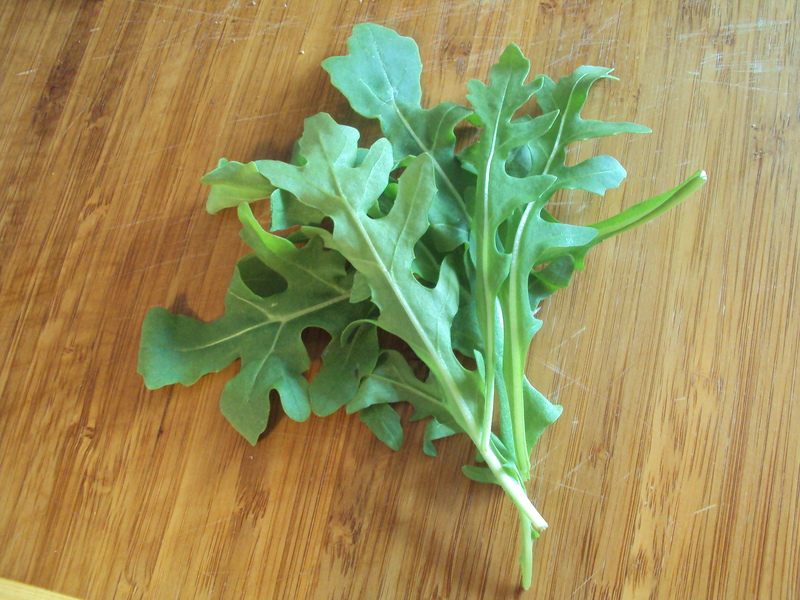 If you have never tasted arugula before, it goes by several different names. Arugula alter egos include: roquette, rocket, rucola and rugula. I really haven’t had much of an opportunity to use it at home this year as it has been ridiculously hard to find any at the market. So needless to say – I was literally jumping up and down, squealing like a little schoolgirl when a trip to pick up some unsalted butter netted a couple of boxes of “my precious” arugula. I’m sure that I got more than one strange look from the other customers in the store. AND…the best part about this recipe is that other than the greens (* this salad is also equally as delicious when you use watercress), everything else is a pantry staple. 1. Toast nuts in a 375F oven until starting to become fragrant. Remove from oven and let cool down. 2. Place dressing ingredients into a small bowl and whisk well. Set aside. 3. 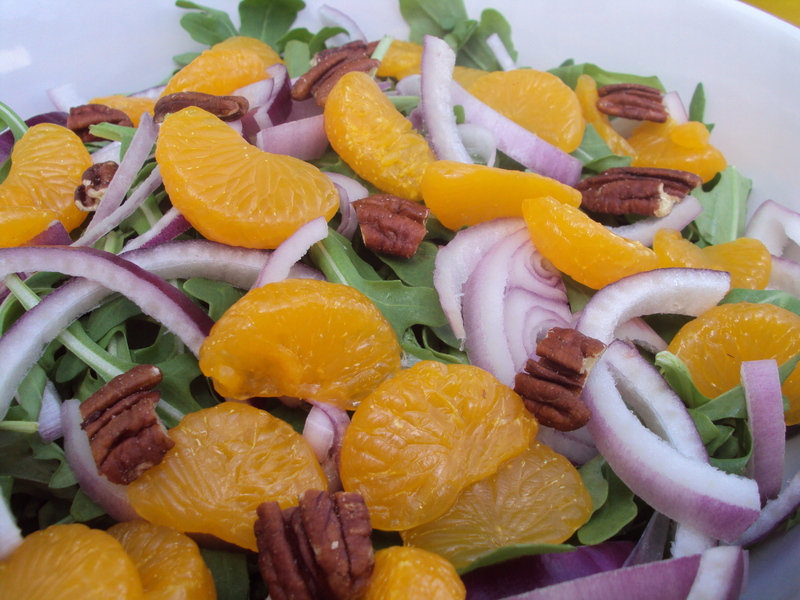 Combine arugula greens, red onion, mandarin oranges and pecans in a large serving bowl. 4. Before serving salad, mix dressing again. 5. Toss or drizzle the salad with dressing. How come you do not have your website viewable in mobile format? Can not see anything in my phone. How odd! I do have the website configured to enable mobile themes. A test loading of my blog on my cellular shows that it comes up in a more simple format, designed to have a fast load time. If browsing from your mobile, you do have the ability for switch from the mobile site to the full site using the link shown at the bottom of each page. I also think thus, perfectly composed post! . buenas noches. 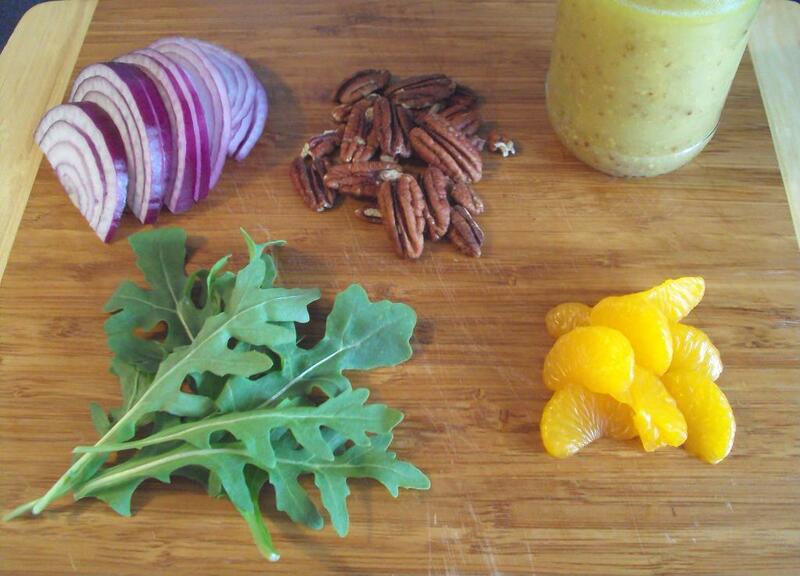 i like your blog Arugula, Pecan and Mandarin Orange Salad The Exploration of Libations and Nosh ~ my delicious journey through life… and will most definitely post a link to https://libationsandnosh.wordpress.com/2011/07/29/arugula-pecan-and-mandarin-orange-salad/ on my site. Thank You for the excellent page – I loved reading it! I have done extensive research on this subject, and agree completely with the way this was written. I only wish I had the eloquence to put it into quality writing. I will certainly make a link to https://libationsandnosh.wordpress.com/2011/07/29/arugula-pecan-and-mandarin-orange-salad/ on my site. I’d forever want to be update on new posts on this site, saved to bookmarks ! .